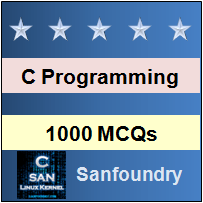 Sanfoundry’s 1000+ Interview Questions & Answers on C helps anyone preparing for Samsung and other companies C interviews. One should practice these 1000+ interview questions and answers continuously for 2-3 months to clear Samsung interviews on C Programming language. 2. What is the scope of automatic variable? 4. What will be the x in the following C code? 6. Which of the following storage class supports char data type?